Since 2015, gasoline and diesel prices in the Vancouver area fuel market appear to have decoupled from supply costs, resulting in high prices that cannot be attributed to competitive market forces or scarcity of supply. This apparent lack of competition has cost each household in the Vancouver fuel market roughly $1,700 between the start of 2015 and the end of 2017. Solutions to this problem could include regulation of the fuel market to reduce gasoline and diesel demand and increase the supply of alternative fuels. 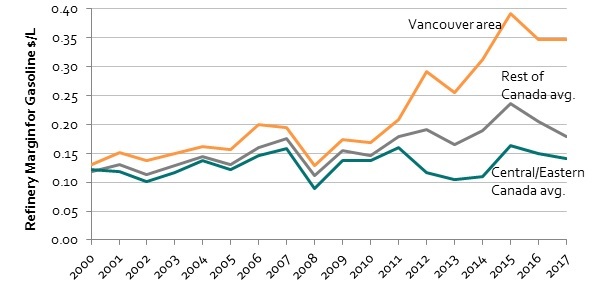 This report provides an analysis of the high gasoline and diesel prices in the Vancouver area of British Columbia. It discusses these prices within the context of fuel supply costs, refining margins (i.e. net-revenues, which can include windfall profits) and provincial fuels policy. The study area includes the Lower Mainland of British Columbia east to Hope and north to Pemberton, as well as Vancouver Island. Wholesale fuel prices in this area are a function of crude oil costs, transportation costs for crude oil and finished fuels, and refinery margins. Since 2015, wholesale prices have increased well above supply cost, driving an increase in the average refining margin within the Vancouver area fuel market that cannot be attributed to competitive market forces or scarcity of supply. High refining margins have resulted in correspondingly high wholesale and retail fuel prices and this apparent lack of competition has cost each household in the Vancouver fuel market roughly $1,700 between the start of 2015 and the end of 2017. Regulation of fuel prices and mandating pricing transparency have been used in other regions to address a lack of competition in the gasoline and diesel markets. In the medium- to long-term, policies such as the Renewable and Low-Carbon Fuel Requirement could increase competition by reducing gasoline and diesel demand and providing an incentive for alternative fuel suppliers to enter the market.